In this guide, we cover the newer method of rubber roof repair, using Peel & Stick + EPDM Primer method, which offers much better results than the older method of using splice adhesive. However, there might be a complicated repair situation on your roof that goes beyond the scope of this DIY guide. 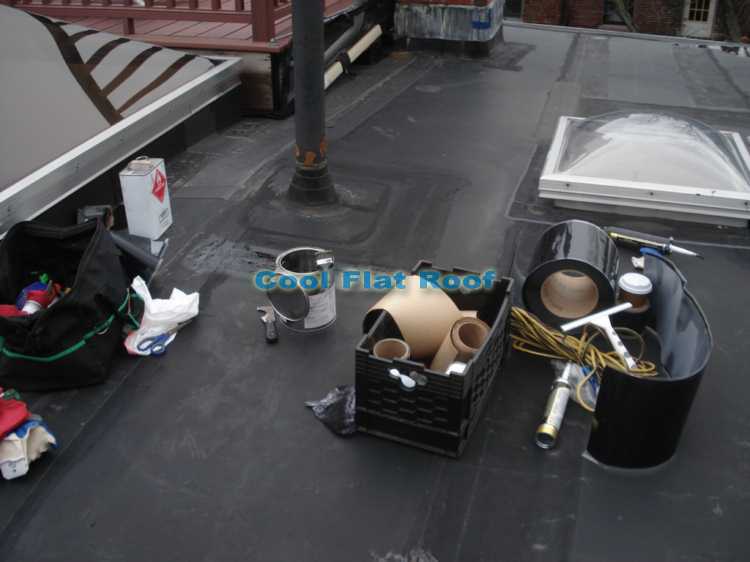 With all our experience with flat and rubber roofing, even we sometimes run into these complex and unforeseen scenarios, which take considerably more time and flashing materials than we had initially anticipated, and basically test our skills in flat roof repair. We find that such cases are beyond the skill and knowledge level of most roofers and even advanced DIY homeowners. If you feel that your roof has one of these complicated cases, we recommend that you hire a professional to fix your rubber roof. 1. Ambient (outside) temperature MUST be 40 degrees F or higher – otherwise the primer will either freeze or the bond will not be as strong as it is intended to be, thus your patch will leak prematurely. 2. Repair surface MUST be dry when you apply primer and patch – otherwise the patch will not hold. 3. Before applying the patch, you must thoroughly clean the repair surface, remove any and all debris, dirt, any tar or other sealants / caulking that might have been applied. 4. It is recommended (but not necessary) in certain situations to also remove old lap caulk, before applying the new patch. We describe the process of locating roof leaks, preparing the roof surface for repair (cleaning / removing debris and foreign materials), applying EPDM primer, and lastly applying EPDM flashing membrane to complete your repair. Generally, a field sheet of rubber roof will not leak, unless there is a hole in it, and you can typically see these holes, when you remove all dirt and debris off the roof. Therefore, look for leaks in other not so visible spots. 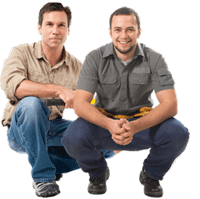 Most leaks occur in common spots – low spots on the roof, where water pools after rain. If you have a seam running through one of these low spots, there is 95% chance that there is a leak. Use a probe or even a nail, to test the seam for any voids / openings. Other spots include inside / outside corners, such as chimney / skylight curbs, or roof to wall connection or pipe flashing, etc. Once you locate the source of a leak, remove all dirt and debris, and using EPDM cleaner (do not use gasoline), clean the surface area thoroughly. Use a dish brush, if the dirt does not come off easily, and pour a little more cleaner over the surface area to clean it better. Once you clean the surface, use another clean rag and a little EPDM cleaner for the final thorough wipe of the repair area. Let the cleaner dry. – using a simple paint brush, apply a good (but not too thick) coat of EPDM primer, making sure it extends at least 2″ beyond the edges of the patch that you are going to apply. Spread the primer evenly, so that you don’t have too much in one place and not enough in the other. Make sure you don’t have thick “puddles” of primer, as it will not completely dry, and your patch will not properly adhere. Once you apply the primer, let it dry for about two-three minutes, depending on the weather, temperature, and how thick of a coat you’ve applied. Once you think the primer has dried – do a tack and pull test. Touch the center of primer with a clean, dry finger, and pull your finger off. If the primer does not stick to your finger, it’s ready for the patch to be applied. If you pull some primer with your finger, let it dry for another minute, and repeat the test. Note: Primer must be dry before you apply the patch – otherwise it will fail to adhere properly! Also, if you applied primer over old glue (which is visible on a rubber roof) or some other sort of adhesive or sealant, which means you did not completely cleaned off the roof surface, the primer will dissolve this old sealant and it will take much longer to dry, before you can apply the patch. Do not add more primer over this spot. However, you might need to re-apply the primer to the area around such a spot, as the primer should not dry for too long. Ideally, you should completely remove any such spots of old glue / sealant, and the rubber surface should be completely free of any foreign materials for best patch adhesion. You may use a plastic or metal scraper to scrape this old material off the rubber. Use additional cleaner and a brush for better results. Also, be careful if you are using a metal scraper,as not to tear / puncture the rubber membrane. If you are applying a patch to a flat area (i.e. – no inside or outside corners or other imperfections), this process should be very easy. Make your patch so that it sticks about 2-3″ beyond the hole in the roof, and round off the corners with scissors. Once you confirm that the primer is dry, remove the film / paper off the back of your patch and slowly apply the patch to the roof surface, making sure you do not trap any air, so that you don’t create any bubbles / air pockets between the patch and rubber membrane. Work your way out from one edge of the patch to the other. Once the patch has been placed down, roll it in with the silicone roller, with moderate pressure. Make sure you roll in the edges of the patch especially well. This is a more complicated / advanced technique and may require some practice, as well as redoing your first patch. Before performing this operation, watch included videos (above) several times to get a good idea of what you will have to do and in what order. Once you applied the primer and let it dry thoroughly, take the 7×9″ corner patch (you may also cut a 6×8″ piece off the 10′ roll included in our rubber roof patching kit), fold it in half, and peel back half of the film (but do not remove it completely). Attach the patch to the vertical part of the outside corner, and wrap it around the corner, making sure that it’s tightly applied without any air bubbles. Now, use your fingers to slowly roll the patch down into angle change from vertical wall onto horizontal roof deck. Do not stretch it there or the bridging (voids / gaps) will occur, and this flashing will not work. It is very important that this transition has no voids or bubbles where the roof goes from horizontal to vertical plane! – otherwise your patch will not work – make this transition as tight as possible. Then slowly start to apply the remaining flap to the horizontal plane. Use your fingers to lightly stretch the patch from the center out and keep rolling it in with your fingers. Continue the process until the entire flap is attached to the roof. Once the patch has been applied, roll it in with silicone roller, paying special attention to step-offs. Roll the edges tightly, and apply EPDM lap caulk along patch perimeter. Disclaimer: This ‘Rubber Roof Repair Guide’ is intended for informational and reference purposes only. We do not recommend implicitly or explicitly that anyone perform any of the procedures described in this guide. We are also not responsible for any property damage or personal injuries resulting from following this informational guide. Copyright © CoolFlatRoof.com – 2006-2014. All rights reserved. Reproduction of the content of this guide is against the law. You may only place direct URL link to this guide. Repair is a hard task if you are not using good products, EPDM Roofing has made t easy to get rid of any problem of roofing. One other question…the 5th wheel I own was originally outfitted with a metal roof. The original owner applied EDPM roof. I need to scrape out the old caulk around one vent due to a minor leak and so I will do the seams of the entire roof while I’m up there. I bought self leveling EDPM based caulk by Dicor for the job. But because I will be getting down to the original metal roof, I’m wondering if that was my best choice? Any feedback or suggestions will be greatly appreciated. Thank you. And where on earth can you buy the ceilling panels for a Fleetwood without going bankrupt in the process? Where can I purchase small amounts of 2 sided tape and primer ? In Lansing Mi. area. You can try this EPDM repair kit that is $249. How about some ideas for fixing a roof that has no positive slope for drainage? Water pools in spots and causes leaks, is there a method to fix this other than keep patching the leaking places? Dennis – ideally you should build ut the roof to create positive slope – this can be achieved with tapered ISO insulation. Then install a new membrane roof (my recommendation is PVC such as IB Roof). If you don’t want to spend the money on Tapered, you can still use IB PVC roof as it’s a great choice for ponding water, but having pooling water on the roof is not good practice. If you keep patching, without getting rid of ponding, it think roof will continue leaking, unfortunately. This is a really great step by step guide and the videos are particularly useful. The beauty and simplicity of an EPDM rubber roof is one of it’s appeals, as it can be pretty easy to fit and repair yourself if you have are DIY competent. However, since one of the selling points of EPDM is improved weather resistance, hopefully this isn’t even something you’ll have to worry about if you do decide to install it! I am trying to find what to use to stop leaked inn our roof. Have tried roof coatings. Would like any ideas you have. We have leaks in a few different places my phone number 910-443-9910. Thanks. We are having siding installed on a 3 story residentail house. The contractor is puncturing the membrane of the flat rubber roof with screws to secure scaffolding. Upwards of 54 holes intotal. Is this normal? What is the best way to make the repairs? Patch or caulking. They are suggesting cauklking? I like the sound of the rubber roof for my own roof. Do people think it is a relatively reliable approach in a country like England where there is a lot of rainfall? EPDM rubber flat roof systems are less expensive than a grp flat roof or fiberglass flat roof and comparable flat roof cost to felt. With a life expectancy of over 50 years combined with its proven impervious ability, durability and reduced flat roof maintenance, is by far better value and the most cost effective flat roof solution to combat flat roof leaks and water damage. I am trying to fing your DIY rubber roof repair kit that sells for$199. Found it the other dau and now I can’t find it again. We actually pulled that information off, and “scrapped” the project (at least for now, while we are still looking into options), due to extremely high costs of shipping Hazardous Materials, which were a part of our roof repair kit. The problem was that neither UPS nor FedEx wanted to touch this, and going through specialized Haz-Mat shipping company would cost about $160 per order, for ground shipping. What I can suggest is going to home depot, and getting some parts there – what they sell is not the best and not exactly what I describe in this article, but can be used for a 50% of DIY rubber roof repairs. The thing you should watch out for is their “Peal and Stick Tape” – only 1/2 of it is really peal and stick, and other is just plain rubber, and it’s divided long-ways. Basically this is rather unusable in most cases, and I have no idea why they are selling it. Would give me some dealer names in Knoxville, Tennessee area. I have a motor-home that I believe this material will solve my roof leaking problem. Thank you for any and all information you can send me. You can try your local commercial roofing supply – Look up Harvey, Bradco, Beacon or ABC roofing supply in your area, and find out if they will sell you what you need. Usually these places sell only to contractors, but I saw them sell to the homeowners a few times – but of course at a premium price. I actually do not think there is a seam tape 2″ wide – they come in 3″ and 6″ widths. You will also need rubber cleaner and primer to apply the seam tape. If they tell you that it is one in the same, find a cleaner somewhere else or use acetone or gasoline to clean seams before you apply the primer. I do however recommend using cleaner instead of acetone/gas, as latter two are not made for cleaning rubber. Where can I purchase EPDM seam tape in approx 2″ width in a roll 50′ long ? Thanks.